* Another strange story - this about the German paratroop legend/Nazi War Criminal who rescued Mussolini, attempted to assassinate Churchill, Stalin and Roosevelt, and ended up farming cattle in Co Kildare. Yes, Otto Skorzeny was some man for one man. An insanely daring soldier and leader of men, an ardent Nazi and the man who (temporarily) saved Benito Mussolini from the retribution of the Italian nation. He masterminded and personally carried out one of the most spectacular commando missions of the Second World War. But Otto Skorzeny was not a hero. He was a fascist, a killer, an SS officer, mercenary for military dictators and - by any measure - thoroughly evil. He was also - for a while - Ireland's least likely beef farmer. * The Gothic Hunting lodge, Martinstown House, is today a luxury B&B set in the classic horse racing country of the Curragh of Kildare. In the 1960s is was home to Standartenfuhrer Otto Skorzeny of the Waffen SS, Hitler's favourite paratrooper. How the man who was born in Vienna in 1907 and helped set up the Austrian Nazi Party in 1931 ended up farming cattle in the Irish midlands is something of a complicated story. But then Colonel Skorzeny was a complicated man. An unapologetic Nazi to the end, he combined farming in Ireland with running an international mercenary agency - serving, amongst others, the apartheid regime in South Africa - and stood by his love for der Führer right to the end. He was the man who was (according to Soviet intelligence) chosen to carry out Operation Long Jump - the German plan to assassinate the Big Three (Churchill, Stalin & Roosevelt) while they were together at the Tehran Coference in 1943. He was also the man who held the military HQ in Berlin from rebel officers after the Valkyrie plot to assassinate Hitler in 1944 came close to succeeding. "Der Furher Was A Wunnerful Dancer!" But it was the daring and successful Operation Oak - the ridiculously dangerous paratroop mission to rescue deposed Italian dictator Benito Mussolini in September 1943, that made Skorzeny internationally famous. The SS officer had been shot down - twice - on two previous missions to locate and rescue Mussolini. The first time, he was the only survivor, the second, his plane was shot down by Allied fighters and crash-landed in the sea. Skorzeny and his crew were miraculously rescued by a passing Italian warship. In the end - Skorzeny led the paratroopers who landed a plane on a tiny mountaintop fortress at Gran Sasso, grabbed Il Duce and flew him off to run a puppet fascist state in Northern Italy, until the Italian partisans finally caught up with him. At 6ft 4in and 18 stone, he was known to his men as "Scarface", thanks to a prominent duelling scar picked up in his youth. After the war, he was captured by the Allies and was due to stand trial at Dachau (site of the concentration camp) but escaped in 1948. He fled using the underground railway for ex-Nazis (and this is where his story gets very Frederick Forsysth) that was (allegedly) set up with the help of high-ranking Vatican officials and ended up in Argentina or Brazil. Later on, Skorzeny would help run the ODESSA network - helping to find gainful work for former SS soldiers with the fascist governments of Spain and several Central American and Middle Eastern Countries. In Argentina, he became a bodyguard for Eva Perón, with whom he was rumoured to have had an affair. He worked as a freelance mercenary/military adviser for dictators in Europe, Central America, the Middle East and (later on) Africa. But his "other" passion - farming - saw him buy Martinstown House and it's 160 acres of prime farming land in Co Kildare in 1958 and play at being the landed gentry. 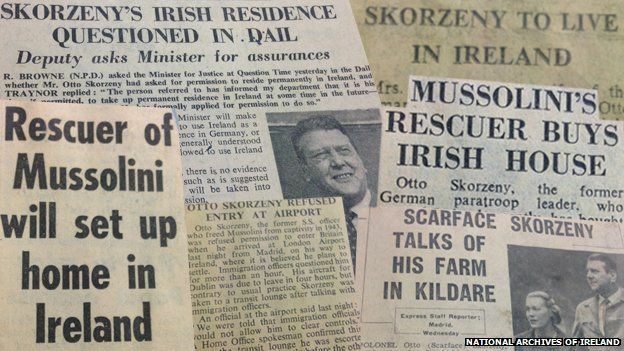 Visa issues - and the fact that he was an international war criminal who had only been granted a partial amnesty - meant that Skorzeny could only reside in Ireland for six months of the year. But while he was a figure of alarm for the Irish government - he was regarded as something of a intriguing, almost glamorous figure by the Irish newspapers and much of the public (he was not, however, overly popular in the locality in Kildare, being something of a stand-offish character. And the whole, y'know, Nazi war criminal thing). He did became a local celebrity in The Curragh, driving around in his distinctive white Mercedes saloon, popping into the Post Office to collect exotically-stamped mail from his "friends and former colleagues" all over the world and even dining out in the best restaurants in Dublin. On one occasion, he was said to have spent an enjoyable night at a glittering social affair in Dublin, chatting to a young TD called Charlie Haughey - who would go on to be Ireland's Taoiseach (prime minister) and who always had an eye for strong leaders who were - somehow or other - worth a bob or two. Of course, Skorzeny wasn't short of friends in Ireland. Our little republic - staunchly Catholic, ready to do the Vatican's bidding and not prone to asking too many questions - ended up as a bolt hole for a number of high-profile ex-Nazis include the successful businessman Albert Folens of Irish schoolbook publishing and Waffen SS fame. (Folens was a Belgian nazi/collaborator who at one stage led the Flemish SS legion). Skorzeny kept up his "international consulting role" right up to his death in fascist Spain in 1975, with one of his last jobs being for the apartheid regime in South Africa, helping to recruit "security and counter-terrorism experts" to fight in the internal and external wars being fought against African liberation movements. His ashes were returned to Vienna (after a Catholic funeral mass in Madrid). And Kildare lost one of it's most notable beef farmers.